His feast is celebrated on May 19. Peter Fioretti was born at Viterbo, Italy, on November 13, 1668. His father, Ubald, died when Peter was very young. The raising of the boy and his stepsister was left in the hands of his mother, Marsha, who had already been widowed once when she married Ubald. When Peter was five years old, his mother dedicated him to the Virgin Mary at the shrine of Our Lady of the Oaks near Viterbo. "Look," she told her son, "this is also your mother. I have made you a gift to her." Peter never forgot that experience, and throughout his life referred to Mary as his "momma." Since his mother could not afford to educate him, Peter's paternal uncle, Francis, provided for his schooling. After working as a cobbler for his uncle, the frail, lean 25-year-old Peter asked to join the Capuchins, desiring to imitate Felix of Cantalice. The provincial minister, Angelo of Rieti, immediately accepted him for the novitiate. However, Peter met with opposition from his family, especially from his mother. Reminding her that she had already given him to the Virgin Mary, she consented to his going to "serve the Madonna." Having gotten to the novitiate, Peter also met with resistance from the novice director who, seeing how frail Peter appeared, advised him to return home. The novice director allowed him to remain as a guest while awaiting a decision from the provincial minister. The provincial minister reminded the novice director that it was the provincial minister's prerogative to accept novices and the director's responsibility to discern the vocation of those accepted. 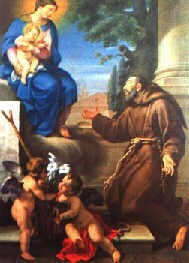 Peter was received into the Roman Capuchin province on July 22, 1693, taking the name, Crispin (after the patron of cobblers). Despite his prior training as a cobbler, in all his 57 years as a Capuchin, Crispin was never assigned as cobbler for the friars. After professing vows on July 22, 1694, he was assigned to Tolfa, as cook for three years, and then passed through a series of assignments: infirmarian at Rome, cook at Albano, orchard keeper at Monterotondo, and finally, questor at Orvieto for 38 years. Crispin knew everyone and everyone knew him, considering him a close personal friend. He possessed an amazing ability to integrate a life of feverish activity, on the one hand, with a solid interior life. Without concern for his own wellbeing, Crispin cared for those stricken during the epidemics at Farnese, Gallese and Bracciano. As questor, he begged for food, not only on behalf of his Capuchin brothers, but also to provide for all the needy of his "big Orvietan family." For the friars, he would only beg for necessities, nothing more. Crispin accomplished a remarkable amount of good in the area of social and spiritual assistance, energetically ministering among the sick, the imprisoned, sinners, unwed mothers, families experiencing hardship and those on the brink of despair. He was a skilled peacemaker both within his own Capuchin community and with others. Before beginning any task, Crispin always prayed first to Mary, his mother. He possessed a contagious joviality and his ministry was marked by a profound sense of joy. Nothing escaped his notice, particularly in discerning what people really needed. Daily he visited the sick and local prisoners, pleading their cause, urging the guards to respect their human dignity, bringing them bread, chestnuts and tobacco, and arranging for families to take turns providing the prisoners with good, home cooked meals. Babies were often abandoned on the doorstep of the friary and then placed in the care of Our Lady of the Star Shelter. Crispin took a personal interest in these foundlings, arranging for their being apprenticed in one or the other trade, and keeping in touch with many of them well into their adult lives. Crispin was filled with intuition and insight which prompted many learned people to seek his counsel. Crispin was convinced that much of human misery, both material and spiritual, was due to injustice. He therefore set about to confront social injustice by admonishing merchants, reminding people of workers' rights, and asking forgiveness of debts whenever possible. He used his sense of humor to lighten people's burdens. Every little occurrence found its way quickly to Crispin's ears. Without hesitation, he would offer himself as a mediator, friend, and counselor. Nonetheless, he was not without his critics and crosses, both within and outside the friary. Some called him opinionated and aggressive; others, a hypocrite. Some friars expected Crispin to make their life easier. When their expectations were not met, they became embittered. Besides many letters, Crispin left a treasury of maxims, among them, "One doesn't get to heaven in a taxi." During the winter of 1747-48, Crispin fell gravely ill and was transferred to the provincial infirmary at Rome. Recovery was but temporary, and on May 19, 1750, the 82-year-old Crispin died of pneumonia at the Friary of the Immaculate Conception located near the Piazza Barberini on Rome's famous via Veneto. Among the many sayings attributed to him was the exhortation, "Let us love God who deserves it!" Beatified by Pius VII on September 7, 1806, Crispin was canonized by Pope John Paul II on June 20, 1982.